The follow-up to their self-titled debut, the newest is filled with indie rock, punk, and pop sounds from the Austin, Texas trio. The Militant Babies' second release. Recorded at The Launchpad in Austin, Texas, by Greg Smelly and mixed by Eric Friend, with artwork by Bryant Worley. 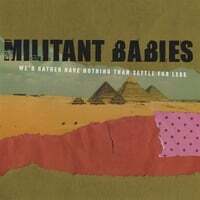 Militant Babies are a 3-piece band from Austin featuring former and/or current members of Fivehead, The Golden Apples, The Shindigs, Crooked Eye, and Death Ray Vision and who play Indie Rock of most stripes, with an emphasis on rock. You can also get the album at iTunes, eMusic, Napster, Rhapsody, and pretty much any other digital place on the Web.